Hello! It's Friday again and today I want to share with you the card that I made for my mom. Mother's day has already passed here in Spain, but since I live a bit far from my family I haven't delivered it yet (my bad). ¡Hola! Es viernes otra vez y hoy quiero enseñaros la tarjeta que le hice a mi mamá por el Día de la Madre. Como vivo un poco lejos de mi familia (y soy un poco desastre también) todavía no la he enviado (muy mal :)). To make this card I was inspired by a new "Sparkle and Shine" challenge and the beautiful photo they provided for it (check it out at the end of this post). And of course, I have made a video showing you the creation process. It can be watched below or at my Youtube channel! Para hacer esta tarjeta me he inspirado en el nuevo reto de "Sparkle and Shine" y la foto tan bonita que nos han proporcionado para la ocasión (podéis echar un vistazo al final de la entrada).Y por supuesto, he hecho un vídeo enseñando todo el proceso de creación. Podéis verlo aquí abajo o en mi canal de Youtube. Hope you liked it! Thanks for stopping by and see you next week! ¡Espero que os haya gustado! Muchos besitos y que disfrutéis del fin de semana. Really pretty. You've done a great job! Your card is stunning! I used the same Wplus9 stamp set for my Mom's card. 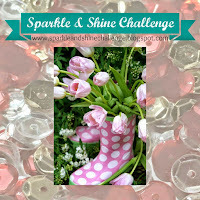 So glad you played along with us at Sparkle and Shine Challenge! This is gorgeous! Such a pretty Mother's Day Card! Thanks so much for playing along with us for the Simon Says Stamp Wednesday Challenge! Oh my this is gorgeous!Love your sparkly border and those flowers are lovely!! Such a soft and pretty card. thanks for playing along with us at Sparkle & Shine!